The design concept, architectural drawings and development application, for the Avon Community Mortlock Gardens development, were prepared by Brighthouse . The project delivered an innovative solution to a shortage of affordable key worker accommodation in Northam and was substantially funded through a Royalties For Region grant. The design elements for the 15 homes, such as brick/stone facades, roof pitch , site levels, colour palette, coordinated fencing and landscaping were designed to integrate with the existing streetscape and dwellings and to provide a sense of identity and consistency. The mixture of one, two and three bedroom dwellings was formulated in consultation with local businesses/agencies to provide a high degree of flexibility to meet market needs. The dwelling sizes were cost effective and appropriate for the intended use. The front and side setbacks were designed to provide an spatially comfortable perspective from the internal private access road, i.e. appropriate with the scale of the dwellings, while providing as much private open space to the rear of the dwellings as could be accommodated within the Design Code requirements. A range of contemporary colours and finishes were incorporated into the design of the development to differentiate and customise the individual dwellings and position the development as a quality group housing project while providing appropriate visual diversity. The landscape strategy provided a welcoming low maintenance environment with a combination of turf and garden beds. The location of trees was carefully selected based on geotechnical engineering advice that trees too close to dwelling should be avoided. Visitor parking was located away from the street frontage, so that the development presents as much as practically possible as a traditional streetscape. Tandem parking has been used to reduce overwhelming the streetscape with double garages. This article seeks to examine the viability of developing vacant Crown Land in the inner suburbs of Ascot, into a small, affordable housing facilities, in the style of a lifestyle village. The concept of developing affordable housing as a lifestyle village is well established in Western Australia, by the private sector. However, over the past decade, private dwelling costs in lifestyle villages have increased significantly, due to an imbalance of supply and demand, as well as limited supply of appropriate land. 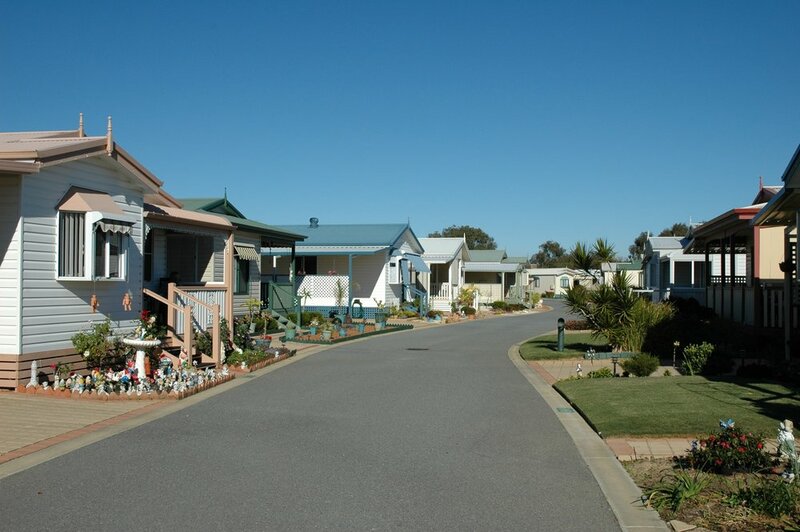 Public sector development of lifestyle village style housing facilities is limited in Western Australia, but has proven successful in other jurisdictions, particularly for workers accommodation. Adding to the affordability of housing in lifestyle villages, for some occupants, the Commonwealth pays rent assistance to recipients of income support payments, including those who receive more than the base rate of family tax benefit (Part A), and pay private rent above minimum thresholds. Fees paid to moor a vessel occupied as the principal home. Rent Assistance is payable at the rate of 75 cents for every dollar of rent payable above the rent threshold, until the maximum rate of payment is reached. Rent thresholds and maximum rates vary according to residents family situation and the number of children they have. Rent thresholds and maximum rates are indexed in March and September each year to reflect changes in the Consumer Price Index. For an eligible sole occupant or couple of homeowners in a lifestyle village, paying site rental a typical level of assistance would be around 40% of the site rental, making lifestyle villages a much more affordable option than single residential ownership in cities, towns and suburbs. The term ‘affordable housing’ is often and widely used but its meaning varies dependant on the context within which it is used. For the purposes of this study, affordable housing is housing which is affordable for residents in lower or middle parts of the income scale. This housing also must be reasonably adequate in its standard and location for these households and “does not cost so much that such a household is unlikely to be able to meet other basic living costs on a sustainable basis” (Disney, 2007). Affordable housing refers to housing available for both purchase and rental and can be provided by the public, community or private sectors. Whilst many of these lots are being withheld from the market by large scale property developers and investors, a large number of lots are being withheld by small scale ‘mum and dad’ investors, speculating in increases in the value of land. These investors are attracted by the existing tax regime, which offers deductions for expenses such as loan interest and council rates on land that is bought with the intention of constructing a rental property. Furthermore, the ‘Gross Rental Valuation’ (GRV) rating regime used in WA provides little incentive for capital improvements, as building upon vacant land increases its rateable value. The restricted availability of land has the effect of increasing the cost of land and thereby reducing housing affordability. The mismatch between the need for smaller more affordable and energy efficient homes, versus the increasing size and cost of houses has continued unabated (ABS 2006; Salt 2004). In WA, there is still a predominance of three, four and five-bedroom dwellings while the majority of demand is for one or two-bedroom homes. In the broader housing system the majority of new homes built are still four by two single detached houses. Not only does this type of dwelling fail to match the predominant household structure but it also increases the cost of building and buying a new home. Housing affordability in Western Australia would be considerably improved if there were a greater diversity of built form, providing a greater range of dwelling sizes and hence prices. When the total burden of unaffordable housing is combined with the other financial commitments of a household, the inhabitants can be said to be in ‘housing stress’. This can occur when low and moderate income households are required to spend a disproportionate amount of their income on housing costs (for example rent and mortgage payments). In recent years, strong housing demand has caused the cost of housing in WA to rise dramatically leaving many on low and moderate incomes struggling to find housing that is both affordable and appropriate for their needs. WA has overtaken the rest of Australia in regards to how much on average is being spent on mortgage costs, with nearly 40 per cent of all owner-occupier households devoting more than 30 per cent of their incomes towards mortgage repayments. Eight years earlier, only one in four WA households were paying more than 30 per cent towards housing costs in 2003–04, whereas over 30 per cent of households in the rest of Australia were paying this proportion. the proportion of households paying more than 40 per cent in disposable income has also been increasing for WA, from 13 per cent in 2003–04 to 23 per cent in 2011–12. those paying more than 50 per cent have also increased significantly, from around 7 to 18 per cent. Most startling is the 73% increase in the Perth Median house price in the five years between 2005 and 2010. This massive rise, has pushed 95% of properties into the “Severely Unaffordable” range, driven thousands of families into “housing stress” and has been the key cause of a record public housing waitlist in the state. In WA, six times the median annual income is required to purchase a home at the median price (Bankwest Curtin Economics Centre, 2014). This is up from 3.6 times the annual income which was required to purchase a dwelling in WA in 2001. The concept is relatively simple. A government agency (Developer) for example, the Housing Authority, Department of Planning or local government provides the land and undertakes the lead in development of the site, Development includes siteworks, below-ground services, roads, amenities and landscaping. A number of sites are prepared for transportable modular dwellings with services connection points to each site. The developer purchases dwellings from a contracted manufacturer, which installs them at the site, ready for occupancy in predetermined stages according to the anticipated demand for the sale of the dwellings. Most of the dwellings are sold at a profit but in most instances at well below the applicable median house price for the locality. The profit offsets the cost of site development and land acquisition. Ideally, approximately 10% of the dwellings should retained by the developer as public housing for rent. Suitably qualified prospective occupants of the dwellings, purchase the homes from the Developer and pay a rent for the site upon which their dwelling sits. Generally, in lifestyle villages, many of the dwelling occupants, are entitled to government support and are therefore are eligible for rent assistance. for the site fee. There are a number of ownership and operating models that could be utilised for the proposed lifestyle villages and similar urban infill developments. The key to establishment of the concept for affordable housing, based on lifestyle villages, is access to suitable land, which may mean the use of Crown land or land vested in, or owned by, local government. The initiation of these projects by government agencies may be critical as the approvals process and the lack of understanding of the concept, can deter the private sector from accepting risk associated with such developments. Once established, the villages can be on sold to investors such as superannuation funds or to established lifestyle village owner-operators or not-for-profit organisations. The design rationale for the proposed lifestyle village urban infill developments is to create an attractive, low impact, affordable housing village that isympathetic to the locality and in harmony with the community and environment. This concept is based on the proposed development of the residential lifestyle villages and operation under a licence issued under the Caravan Parks and Camping Grounds Act 1995 (or any subsequent act replacing this). A Lifestyle Village is defined in the Residential Parks (Long-stay Tenants) Act 2006 and regulated by Residential Parks (Long-stay Tenants) Regulations 2007. The purpose of developing the proposed affordable residential housing as a lifestyle village is the flexibility provided by the legislation in terms of density, operation and management. Residential Lifestyle Villages can enhance the locality and provide quality affordable housing. The modular park homes are quick to construct and are as liveable as their site-built alternatives. A variety home styles, facades and colours make for attractive streetscapes and shared amenities improve liveablity. 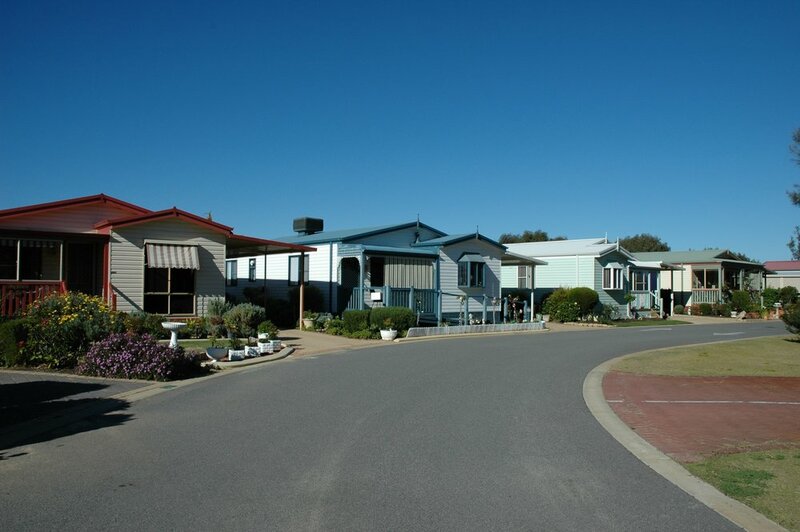 Following the proclamation of the Western Australian Caravan And Camping Act 1995 and Caravan Parks Regulations 1997, Brighthouse was quickly of the mark, to seek an appropriate site for a Lifestyle Village. A site, which met all the requirements was located near central Mandurah and on the banks of the Serpentine River. The cost of the land was significantly lower than the surrounding residential land, due to the requirement to fill the river floodway. Brighthouse negotiated with a local civil contracting company to install the many hundreds of cubic metres of sand fill from a local quarry, which maintained viability of the project, and enabled Brighthouse to propose the development Fleetwood Corporation. 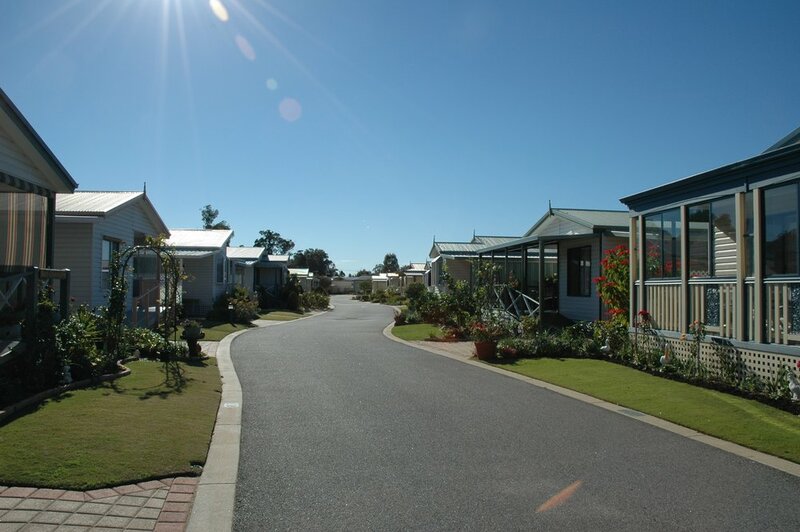 Fleetwood are manufacturers and suppliers of park homes in Western Australia and sought to have a quality Lifestyle Village as a benchmark for future developments. A concept plan was prepared, which provided a yield of 160 park home sites and associated lifestyle village facilities, including a clubhouse, swimming pool, bowling green and passive recreation areas. Brighthouse lodged an application for planning consent on behalf of Fleetwood, which was granted by the City of Mandurah. Once the approvals were in place and the successful development of project assured, Brighthouse negotiated the sale of the development to a third party investor, who proceeded to completion of the project with a sale and supply agreement in place with Fleetwood for the park homes. The 160 homes quickly sold to homeowners who understood the benefits of transitioning from ownership of residential housing to the security and communal interaction of a lifestyle village. Today, Mandurah Gardens Estate retains it's mantle of one of the most harmonious, enjoyable and affordable Lifestyle Villages in Western Australia. As key project personnel, engineering consultants on other specialists were required to be at the site, accommodation in Hopetoun and the nearby town of Ravensthorpe became critically short. The impact on rental accommodation cost was enormous, skewing rents to the point that they became unaffordable for average workers and other residents. The park home village was completed in record time and immediately helped to relieve housing stress in the town by accommodating much of the influx of workers. The village operated for rental housing until the Raventhorpe Nickel Project's untimely closure. Wavecrest then morphed into a residential housing and tourist caravan park facility and remains in operation some 20 years after. Wavecrest Village is a carefree lifestyle option that allows residents to enjoy superb resort style facilities in Hopetoun’s most exciting new neighbourhood. By recognising the trend towards busy lifestyles and the demands this places upon individuals and families, Wavecrest Village has developed a sense of community that eases the pressures associated with working and living in a mining town environment by placing an emphasis on the simple things like safety, security and personal freedom. Providing 2 and 3 bedroom executive home accommodation, short-term tourist rental accommodation and caravan and camping sites, this the new alternative to worker's camp or residential subdivision living. Garrjang Village - A bold concept from Brighthouse Consultants that brought sustainable benefits to the State of Western Australia from a major construction Project. Brighthouse was engaged by Tourism WA to conduct a major audit of caravan and camping infrastructure in Western Australia, undertake a gap analysis to ascertain priority needs for the sector and provide a draft caravan and camping strategy to assist planning for the future of this important tourism market segment. Brighthouse worked with the operators of Coral Coast Tourism Park on a masterplan to provide a program for the staged upgrade of the holiday park sites, facilities and accommoddation. Liz and John Watts have brought forward the development plans wiht a state of the art new ablution facility which features individual family bathrooms. The addition of new spa chalets provides more quality accommodation for this popular caravan park.